Vai is married to Pia Maiocco, former bass player of Vixen, who can be seen in Hardbodies. Vai and Maiocco have two children; Julian Angel and Fire. In his spare time Vai is an avid beekeeper - his bees regularly produce a crop of honey that Vai sells for his Make a Noise Foundation. Vai is an accomplished studio producer (he owns two: "The Mothership" and "The Harmony Hut" and his own recordings combine his signature guitar prowess with novel compositions and considerable use of studio and recording effects. Vai also helped design his signature Ibanez JEM series of guitars. They feature a hand grip (fondly referred to as a "monkey grip") cut into the top of the body of the guitar, a humbucker-single coil-humbucker DiMarzio pickup configuration with several different types of pickup including Evolution, Breed and EVO 2. He also uses the Ibanez Edge and Lo-Pro Edge double-locking tremolo systems (the current production JEMs have the newer Edge Pro), as well as an elaborate and extensive "Tree of Life" inlay down the neck. However, the 555 model is widely criticized for being too expensive and finished poorly. 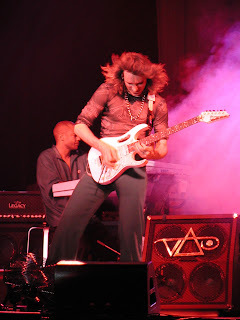 Vai also equips many of his guitars with an Ibanez Backstop, a tremolo stabilizer that has been discontinued. Lately Vai has also equipped some of his guitars with True Temperament fretboards in order for his chords to sound completely in tune. Vai also has a 7-string model designed by him named Ibanez Universe. The Universe later influenced the 7-string guitars used by Korn and other bands to create nu metal sounds in the late 1990s. He also has a signature Ibanez acoustic, the Euphoria. Before Ibanez, he briefly endorsed Jackson guitars, but this relationship only lasted two years. Steve Vai has also worked with Carvin Guitars and Pro Audio to develop the Carvin Legacy line of guitar amplifiers. Vai wanted to create an affordable amp that was unique, and equal in sound and versatility to any guitar amp he had previously used. 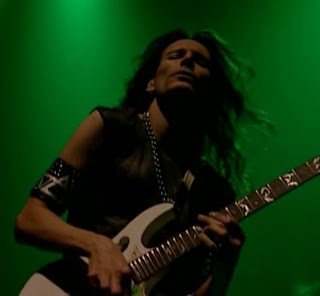 Over his long musical career, Steve Vai has used and designed an array of guitars. He even had his DNA put into the swirl paint job on one of his signature JEM guitars, the JEM2KDNA, in the form of his blood. Only 300 of these were made. Nowadays he mainly uses his white "Evo", a JEM7V, and his "Flo", which is a customized Floral Jem 77FP painted white. They are both inscribed with their names in two places, mainly in order to allow him to distinguish between the guitars he uses onstage. "Flo" is equipped with a Fernandes sustainer system. Vai is widely recognized as a highly technically advanced rock guitarist and has been described as a virtuoso in the world of guitar music . His 1990 album Passion and Warfare and the ballad For the Love of God in particular received a significant amount of press and are often cited by critics and fans alike as amongst his best work to date . Vai's playing style has been characterized as quirky and angular, owing to his technical ability with the instrument and deep knowledge of music theory. His playing can also be described as lyrical as if sung by a human voice. That is why his melodies are hard to duplicate as they are not strict tempo. In fact sometimes terribly close to off tempo, as if falling down a flight of stairs but landing on your feet. 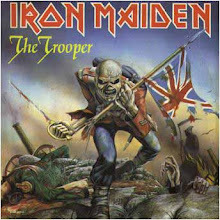 He often uses exotic guitars; he plays both double and triple neck guitars, and is regarded as the first to use the 7-string guitar in a rock context. Along with Ibanez, he designed a signature 7-string guitar, the Ibanez Universe in 1989, which provided the low-end rumble many guitarists were craving.